I can’t beleive I’m saying this already, but the holiday season is here! And, so, with it comes A LOT of entertaining. Give this easy, fresh and bright recipe a try. It will be a beautiful addition to any buffet, or delightful as a first course. Enjoy! Trim and peel the asparagus. Blanch the aspargus in boiling water for 30 seconds. Drain and rinse the aspargus with cold water for at least one minute to stop further cooking. Drain again and allow to dry on a towel. Prepare the prosciutto by pulling apart or cutting into pieces measuring about 1 inch wide by 4 inches long. Spread about one teaspoon of the cheese mixture onto a strip of prosciutto. 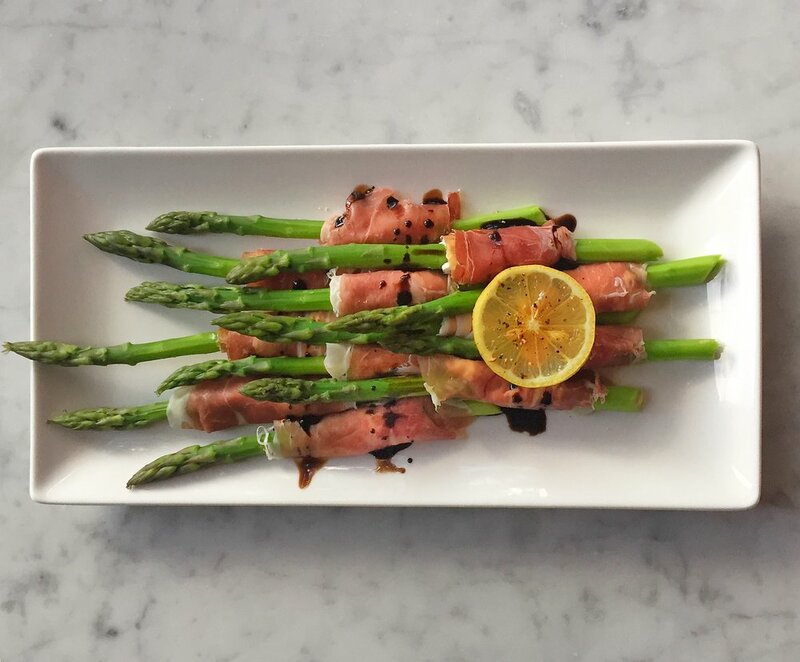 Place one asparagus on top of the cheese and roll prosciutto around the spear. Place on a platter and drizzle with aged balsamic vinegar to finish.